(Newser) – Steve Bannon spoke at the Conservative Political Action Conference on Thursday, and it looks like President Trump's chief strategist wasn't exaggerating when he talked about the commander in chief's plans for "deconstruction of the administrative state." Per Reuters, Trump surrounded himself Friday with CEOs from some of the country's biggest companies—including Johnson & Johnson's Alex Gorski, Dow Chemical's Andrew Liveris, and Lockheed Martin's Marillyn Hewson, whom Trump called "a very tough negotiator," per the White House's documentation. 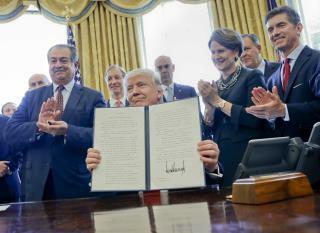 Trump then added his signature to a new executive order that's designed to streamline federal regulations or get rid of them altogether. Atta' boy Mr. President. Make them roll up their sleeves and get to work. Can't fix it if we don't know what's wrong with it. Hope it works out. Deregulation causes the bad corporations to take advantage, which caused the bubble and economic crisis.